A very nice quality English oak carved decanter set and case fitted interior with a release button revealing a card drawer. 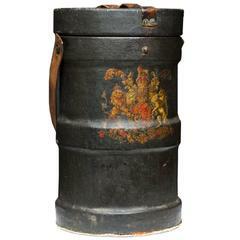 Very well carved and handsome brass mounts. 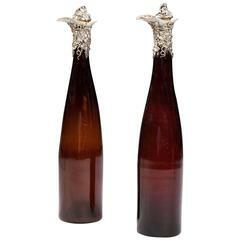 Elegant pair of early to mid-19th century English handcut glass bottle form decanters. The diamond cut decanters with spear panel cut stoppers, England, circa 1830-1840. 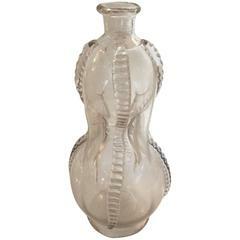 Handblown double gourd shape glass bottle or decanter. 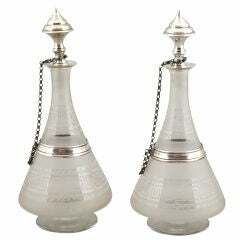 Pair of Dutch glass decanters decorated with etched Greek key design and sterling silver collars, stoppers and chains. Swedish Kosta Boda Cut Crystal Lidded Decanters with silver plate collars both engraved “sherry”, late 1800's. The 19th century English cut-crystal decanter has a variety of designs including repeated diamond and leaf-like patterns. The neck has rings for a secure grip.